Full marks to the improving Madeleine Probert who won the first of our three Drawn Partners Tournaments today. Partnered by Chirs Roberts, who stood in as a late replacement for a withdrawal, the pair were undefeated throughout. Madeleine ran some very good long hoops and hit some firm clearances as the pair made light of the heavy conditions on a chilly day. In fact everyone who played deserves a pat on the back for soldiering on in the constant wind and more than occasional drizzle. 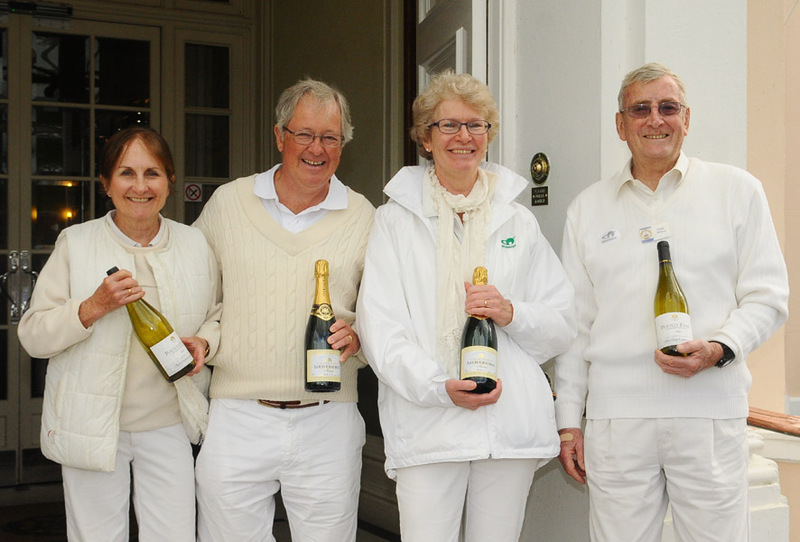 The winners took home the traditional champagne ahead of Dianne Browne and Philip Allison who they defeated 7-5 in the final at the end of a long day. PCC 'A' went down 2 - 5 at Cheltenham today and so are out of this season's national Inter-Club Championship at the first hurdle. Chris Roberts and Charlie von Schmieder won the morning doubles, but Helena and Mike Fensome both lots their singles games so we were 1 - 2 down at the lunch. The continual stoppages for the donning and removal of waterproofs hampered the continuity of play somewhat and only von Schmieder recorded a singles victory in the afternoon. Overall, a disapoining day. Congratulations to Harry Midgley, who discovered his old form and swept all before him at Budliegh Salterton this past week. Playing in his second tournament of the season at his old club, Harry won ALL EIGHT of his matches to win the Division 2 event and bring home the JK Brown Memorial Cup (photo left). Harry's good performance at this and his previous outing have seen is AC handicap move down from 6 to 4.5. PCC players were to the fore as Oxfordshire sneaked qualification for the County Championships Tournament in September. Today they tied for the second qualification place with the Gloucestershire/Worcestershire (G/W) combined team, in a three sided series of play-off matches at Hamptworth. PCC players Chris Roberts, Helena and Mike Fensome, together with John Spears of Surbiton won eight games overall, matching G/W's tally behind the clear winners Middlesex. Fortunatly for Oxfordshire, they had a better (27 points) net hoop score than G/W and so will now be in the line up for the Championship at Southwick, near Brighton on 13 &14 September. It was a nail-biting 13th hoop decider that swung one way and then the other before Raymond Wood became the second name on our Handicap Singles Tournament (Black Ball) trophy today. Dainne Browne looked to have that last hoop in the bag when Wood uncharacteristically 'fluffed' a clearance that took out his own ball and left her with a free shot at the hoop. But she pushed that one wide and then missed a crucial clearance of her own to hand Wood the title at the end of a long day's action. Although handicap play was relatively new for many in the field, all enjoyed the increased interactively around the hoops that 'extra turns' tends to provide. Colin Morgan (who eventually ended up joint third with Raghu Iyer) shared the 100% wins distinction with Nina Cox at the half way point and both Roger Goldring and Mike Fensome also looked to be on good form before dropping out of contention after lunch. Former PCC member Peter Honey returned today with teammates from his new club Roehampton and the friendly fixture of handicap games ran out to be an amicable 3-3 draw. 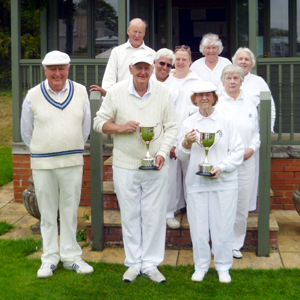 In the morning doubles, June Robinson and Frances Colman won their match whilst Honey and partner Peter Siddall got the better of Brian Bucknall and Raghu Iyer. The afternoon singles were also shared with Bucknall and Robinson winning for PCC. In the first friendly of it's kind for some years at PCC, The All England Club of Wimbledon visited to play both Association and Golf Croquet on adjoining courts. Honours were shared at GC but the visitors certainly had the upper hand at AC, winning all four games. A lovely letter of thanks has been recieved from the Wimbledon captain who looks forward to welcoming our players to his club next season. Entries are urgently needed for our open Singles (Blue Ball) Tournament on Friday. Please sign-up on the poster in the pavilion without delay or, if you can't get there, give Chris Roberts a call on 079 7378 7710. Harry Midgley reports: Phyllis Court took the notable scalp of Oxford University in the first AC Handicap League match of the season. Our captain Harry Midgley (handicap 4.5) narrowly defeated their skipper Harry Fisher (-1) by 2 points and Brian Bucknall (7) had a superb game to beat Ian Plummer (-0.5) +14 (even after a few hiccups with the wrong ball being played by both players). Elizabeth O'Dair (10) played with verve and determination and she too won her game easily in the end +17 points against Mark Van Loon (10). Raghu Iyer (18) struggled against the up and coming Jordan Waters (12) and lost -18. It was good to see Harry Fisher, who took part in the World Championships last year, playing at PCC and attempting dramatic peels with 'death rolls'. He was unlucky to lose and only did so by playing a fault when attempting a jump shot on Rover with his second ball following a successful peel of his partner ball. 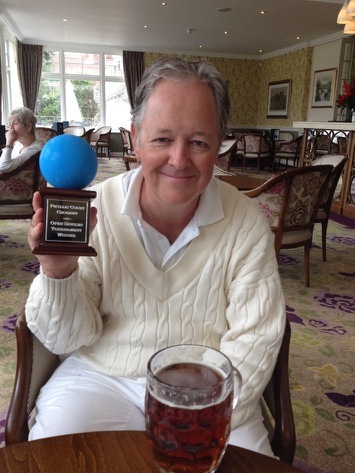 Two tough games at the end of a very wet day decided that the 'Blue Ball' Trophy would be going away with its fourth different winner in as many years. Chris Roberts faced undefeated Mike Fensome in the penultimate round of the single block games that would determine the tournament's victor. Mike got off to a good start and lead 3-1 before Chris clawed back level before a disaster befell 2012 winner Mike. After 'threatening' to strike Chris' ball twice previously in the game, he finally forgot himself and did actually play it - and a 'good' shot it was too, right in front of hoop 8. It was the turning-point and Chris then romped away with the rest of the hoops to win 7 - 3. That meant the Helena Fensome could force a three-way tie with hubby Mike and Chris, if she won her last round match with the latter, as Mike (who'd finished his programme) could only sit and watch from the pavilion verandah. And that was the best place to be as the rain thumped down and Chris fought back to close Helena's lead. The pivotal hoop was no.11, which was contested for fully 15 minutes until Chris finally ran and took the lead for the first time. Helena duly won the 12th but the big advantage of a first approach to 13 was good enough for Chris to win the game. - Sadly there were only seven entrants to this tournaments, which is our premier Singles ond-day event of the season. Harry Midgley reports: This is the tournament where the lower handicap players are teamed with the high bisquers and is always exciting. Six teams competed over two days using a block format so that all the teams played each other in a series of five games. To enable all the games to be played in two days a time limit of two hours for each game was adopted, which made for some exciting finishes, and some rather tired players! Also a 22-point format was used, whereby the higher handicap player started on hoop 5 whilst the lower handicap player starts on hoop 1 with the higher handicap player having the use of up to 6 bisques. All of the higher handicap players exceeded the expectations of their partners and there were even a number of games which were pegged out. 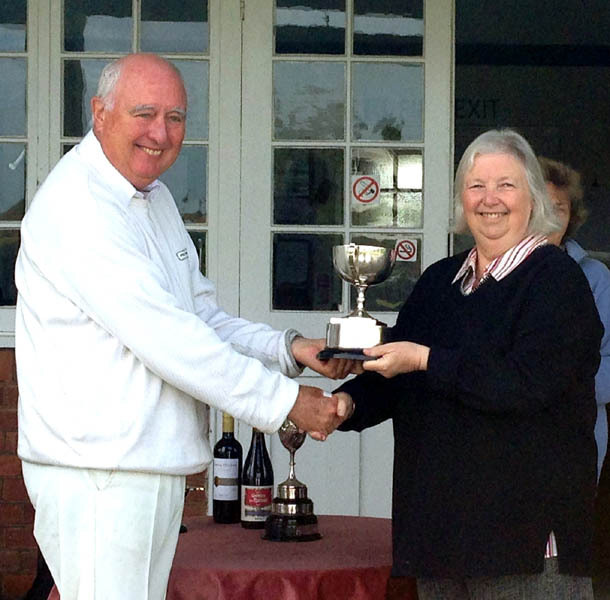 The wily old campaigner, Brian Bucknall and his partner Nina Cox triumphed by winning four of their five games but, as an example of how close the competition was, there were three pairs with three wins who were the runners-up. These were TJ Johansen and Pauline Wood, Harry Midgley and Dianne Brown and June Robinson and Joanna Iyer. The tournament was expertly managed for the first time by Raghu Iyer.